François-Désiré Froment-Meurice (1802-1855) was one of the most important French jewellers and silversmiths of the nineteenth century, described by famed author Victor Hugo as the Cellini of his age. His works were acquired by royalty throughout Europe, including Queen Victoria and Prince Albert, Louis Philippe and Queen Maria Amelia of France, the Queen of Naples, the Duchess of Parma, and the royal family of Spain, to name a few. His firm perhaps reached its greatest fame after the Great Exhibition of 1851 in London, where they won the prestigious Council Medal. The Art Journal Illustrated Catalogue wrote of their stand: 'The visitor to the Great Exhibition may search in vain...for works more truly beautiful of their class, than those contributed by M. Froment-Meurice.' Queen Victoria and Prince Albert were similarly impressed, and purchased a number of pieces from their exhibit, which further encouraged the firm's popularity. The Victoria and Albert Museum, then known as the South Kensington Museum, purchased its first piece of jewellery from Froment-Meurice at the fair, a bracelet which remains in the collection to this day. The Renaissance Revival, as seen in the present pendant, and the Gothic Revival were Froment-Meurice's preferred decorative styles. Historicism was a major design trend of the nineteenth century, encouraged by the Romantic Movement which, among other tenants, idealised times of yore. The Renaissance Revival was one stylistic variant, perhaps first stimulated by the resetting of some of the French Crown Jewels by the Parisian jeweller Bapst to be worn by the Duchess du Berri at her 'Mary Stuart' quadrille in 1829. The style was then adopted by Froment-Meurice and his fellow Parisian jeweller Frédéric-Jules Rudolphi (1808-1872) in 1840s and 50s, and then by Jules Wièse (1818-1893), a disciple of the former, whose firm carried the mode through the end of the century. Froment-Meurice's work in particular is characterised by a focus on fine metalsmithing rather than gems, and a reintroduction of quality enamelling. Many of the jewellery designs of Froment-Meurice are easily recognized for the use of a central oxidised silver full-length figure or group of figures set into a gold architectural mount, often with enamel accents, and occasionally embellished with gems. His other primary method was to decorate free standing figures entirely in colourful painted enamels. He employed some of the most prominent full-scale sculptors of the day to model the figures. The use of oxidisation, or argent noir as it was called in French, acted to enhance this exceptional sculptural work, as well as to lend the pieces the patina of age. Instead of copying Gothic and Renaissance jewels directly, like contemporaries such as English designer A.W. Pugin (1812-1852), Froment-Meurice seems to have been much inspired by fifteenth century Italian painting as well as sixteenth century French ecclesiastical sculpture, in which Renaissance figures were retrofitted into Gothic architecture. Though he was the first to integrate them into jewellery, similar designs were found in pattern books of the day, including the Recueil de decorations intérieurs comprenant tout ce qui a rapport a l'ambeublement (1831) by Jacob Petit, a ceramic manufacturer, which, based on similarities to his jewels, Froment-Meurice must have known. Angels, the Virgin and Child, knights, and ladies in period dress were among his most common themes. Another source of inspiration was Renaissance hollowware, such as the famed Cellini salt cellar, which featured attenuated human figures and, when in gold, colourful enamelwork. The central figure and flanking putti in this piece are identical to those found in one chatelaine and four brooches by Froment-Meurice, the chatelaine in the Stattliche Kunstsammlungen Kassel, and the brooches in the Schmuckmuseum Pforzheim, the Hessisches Landesmuseum Darmstadt, the Birmingham Museum (once part of the famous Anne Hull Grundy collection, 1981M598 http://www.bmagic.org.uk/objects/1981M598), and one sold by Sotheby's London in May 1985. These examples also bear a similar gold and blue enamel architectural mount, and differ only in the surrounding and pendant embellishments. The chatelaine, however, also suspends a small seal fob and watch key as in the present example. Another brooch by Froment-Meurice in the collection of the Victoria and Albert Museum London (M.12-1964 http://collections.vam.ac.uk/item/O115765/brooch/), as well as two nearly identical bracelets, one in the Ulf Breede Munich and one in the Musée d'Orsay Paris, feature the same central female figure, this time as an angel with wings, standing in a Gothic style niche, encircled by an oval blue enamelled silver frame. A design for a brooch identical to the present piece with the exception of the addition of the fleur-de-lis and pendant elementsmore similar than any of the examples discussed above---was published in Henri Vever's La Bijouterie Française au XIXem Siècle (1906-1908), in which it is called the broche renaissance, and dated 1847. The actual manufacture of this design, however, seems likely to have been executed, at least in part, by another Parisian jeweller of great renown, Jules Wièse. 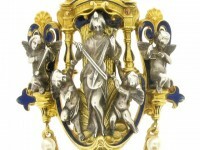 The Munich bracelet as well as the Sotheby's brooch bear the marks of both Froment-Meurice and Wièse; in the case of the other examples the marks are in varying states of preservation. Froment-Meurice is known to have contracted other makers to produce parts of his designs, one of whom was Wièse. Wièse began working for Froment-Meurice in 1839, eventually becoming workshop manager. Though opening his own shop in 1844, Wièse continued to work exclusively for his former firm. He received a medal for his collaboration with Froment-Meurice at the 1849 Paris Exhibition. But by the 1855 Paris Exhibition, held just after the death of Froment-Meurice, Wièse had his own display. Thus it seems probable, based on the design drawing, the two dual marked pieces, and the documentation of their relationship, that this pendant was also a collaboration of the two masters, made sometime between 1847 and 1855. Charlotte Gere and Judy Rudoe, Jewellery in the Age of Queen Victoria: A Mirror to the World, London: British Museum Press, 2010. Clare Phillips, Jewels & Jewellery, London: V&A Publications, 2000. Diana Scarisbrick, 'Froment-Meurice', Apollo Magazine, 14 July 2010. Frances Wilson and Caroline Crisford, ed.s, The Belle Époque of French Jewellery: 1850-1910, London: Thomas Heneage & Co. Ltd., 1991.